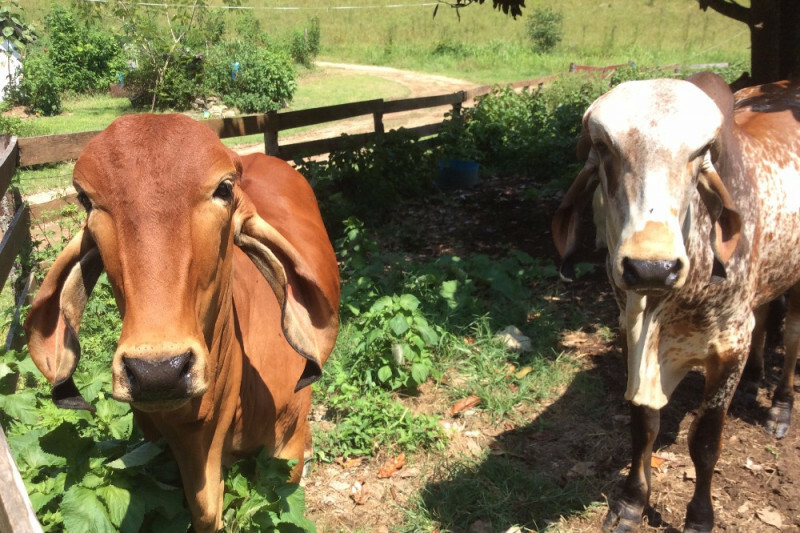 Murari's Kirtan Valley Farm is a non-profit community dedicated to the protection of all living creatures... especially aspiring devotees of Krishna and, of course, Krishna's cows. This 265 acre project was founded by His Divine Grace A.C. Bhaktivedanta Swami Prabhupada in 1976... his order was to create a self-sustainable village... centered around Radha, Krishna and the cows. Every day the residents and visitors devote their time to sadhana-bhakti (with emphasis on Harinama Sankirtana) and by the grace of Govinda, the Protector of the cows, we have a small herd of these divine creatures in our care... mostly Jersey cows and now we have been gifted a pure Gyr cow and bull... a breed that dates back 5,000 years to Lord Sri Krishna and is now struggling to be preserved. The cows here are very well loved and cared for... we sing to them, brush them, and milk them by hand. We are assiduously seeing to their health in all ways. Their divine gifts of milk, butter, yogurt, and ghee are all offered to the presiding Deities Sri Sri Nitai-Gaurachandra and Radhe-Murari... all prasad is distributed to the residing and visiting devotees. Their dung is treasured tor use in the flower and vegetable garden and for making dhoop sticks used in daily puja. We also collect their urine for healing purposes. Our tractors are constantly in disrepair, one being from the 60's and still kicking. We would feel extremely grateful for a newer model tractor that will not break down, given proper maintenence. We want these cows to be fed well year-round. Srila Prabhupada taught us the importance of this service... "The proprietor of all land, the maintainer of all land, to give pleasure to the people of all land, is Govinda, Krsna. Govindam. And He is the protector, and pleasing to the cows. You have seen many pictures of Krsna, He is loving cow. Why cow is loved by Him? Why not another animal? There are many other animals. Why particularly cow? Because cow protection is the most important business of the human society. " Our ardent endeavor is to please Srila Prabhupada and all the Vaisnavas. Thank you so much for your interest and time. Please come visit the temple anytime... take darshana of the Lord and feed our beautiful mother cows a handful of fresh grass. "A person who serves the cow, and takes care of her in all respects, receives the most rare benediction from her. Do not become envious of her, even in your mind. Always try to please her and serve her as far as possible. A human being who joyfully serves the cow daily becomes fit to receive great prosperity." "One accumulates great piety by feeding a cow. By tending the cows in the field, one becomes eligible to live in heaven for countless years. By building a cowshed one becomes the king of the whole province. Simply by feeding her salt one attains good fortune." "The Ganges personally lives in the head of the cow... The ancient acaryas have accepted the cow as the form of Lord Visnu. The cow is fit to be worshiped, glorified, and offered obeisances. A human being should feed the cows and serve her." Please help us give our cows everything they need... Prabhupada wants us to protect Mother Cow, at all costs. This is our duty, please support this good cause.